Marc talks about what happened on this day in history, including the day Oriole Frank Robinson became the manager of the Cleveland Indians, the day 128 men were killed in a mining explosion at Banner Mines outside Birmingham, and the founding of the Student Non-Violent Coordinating Committee. This is Marc Steiner, and today is April the 8th. That was former LA Dodgers executive Al Campanis in dialogue with Ted Koppel when he appeared on ABC’s storied news program Nightline in 1987. Campanis had played alongside Jackie Robinson in the Minor League at the start of his baseball career. Those blatantly racist remarks demeaning the mental capacity of Black people to lead a Baseball franchise led to his dismissal immediately after his appearance on Nightline. We play that because 12 years before this clip aired, the great Oriole Frank Robinson became manager of the Cleveland Indians. It took this exchange on Nightline to open up the eyes of Americans en masse to the fact that there were few black managers and no black general managers in Major League Baseball, despite the great achievements of black players in the Major League. In keeping with opening days of our America’s national pastime: We celebrate a moment that took place today in 1974, when Hank Aaron, a player who helped break racial barriers in baseball, hit his 715th career home run, surpassing Babe Ruth’s 39-year-old record. And today, 128 men, most of whom were African American, were killed in a mining explosion at Banner mines outside Birmingham, Alabama in 1911. These men were victims of the reinstitution of legalized slavery after the end of Reconstruction and the creation of America’s system of segregation. Blacks and some poor Whites were imprisoned for long periods of time for minor crimes, and then were leased out to corporations as labor for no compensation as these men were who died today. 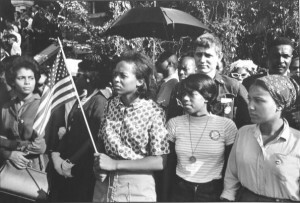 And 126 student activists met today in 1960. Many of them were veterans of the first sit-ins in places like Greensboro, North Carolina, coached and prodded to independence by the great civil rights leader Ella Baker. They formed the Student Non-Violent Coordinating Committee on this day in 1960. Among those gathered to begin a radical non-violent push to end segregation and racial terror were John Lewis, Diana Nash, Julian Bond, Stokely Carmichael and Rap Brown. And we want to wish actors Robin Wright and Patricia Arquette Happy Birthday, born in 1966 and 68 respectively. Happy Birthday also to Seymour Hirsch, one of America’s best investigative journalists, who broke the My Lai Massacre story in 1968. At 78 years old, he is still muckraking and holding power’s feet to the fire. And today is the birthday of former UN Secretary General Kofi Anon, first African head of that world organization.